The native land of the tribal community of Bheels, Banswara in Rajasthan is a primeval town that is presently referred as the 'City of Hundred Islands'. The town is so called due to the river Mahi, which borders the district and surrounds a number of islands. A popular tourist destination, Banswara is a town worth visit. There was a revolt by Bhil tribal, led by the social reformer Govindgiri, in the year 1913. The revolt resulted in the "Mini Jallianwala Bagh Kand", a mass destruction where hundred of Bhils were shot at. The massacre took place at Mangarh hummock where the Bhils were holding a peaceful meeting. The site, now called the Mangarh Dham, has since then assumed sanctity. The year 1949 saw a merger of Banswara state and Kushalgarh chieftainship in Greater Rajasthan. Since then, Banswara has been regarded as a separate district. The Mahi River divides the Banswara and Dungarpur districts into two distinct regions. Banswara lies in the southeast part of Rajasthan, and is bordered by Udaipur in the west, Chittorgarh in the north, and the states of Madhya Pradesh and Gujarat in the east and south respectively. Bhils constituting half of the total populations Banswara has its name derived from Bans or bamboo trees, which once grew here in profusion. Maharaja Jamal Singh founded the erstwhile state. With Udaipur and Chittorgarh, forming its boundaries, the district presently comprises of the territories of former Banswara State and the Chieftainship of Kushalgarh. While the central and western portion of the district is fertile plains, the scattered ranges of the Aravali form the eastern region. The ancient town is surrounded by a stone wall, now in ruins. A palace of a former ruler of Banswara stands overlooking the town. The teak forests are found on the slopes of the Aravali hills. Mango, Khajur and Mahua trees are also a part of the vegetation of the district. Banswara has rich wildlife including squirrels, lizards, snakes, chinkara, ronj and four horned antelope. Panthers can be seen rarely. The avian variety includes the black dragon, grey shrike, green bee-eater, parrot, jungle crow, wood pecker and common myna. Grey jungle fowl and grey partridge are generally spotted in the remote parts of the forests. A part of Mahi Bajaj Sagar Project, beautiful fountain gardens overlooks the Kagdi Lake. 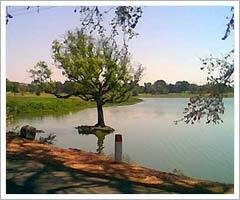 On the eastern side of the town is an artificial lake also known as Bai Talab, which is said to have been constructed by Lachhi Bai of Dior; the Rani of Maharawal Jagmal. Couple of holy tree known as "Kalp Vriksha" which is said to fulfill the desires of the visitors is also present nearby. The charming surroundings also attract many visitors over here. Component of this lake remains covered with beautiful lotus flowers. Badal Mahal, the summer residence of former rulers is located on the edge of the lake. A shrine of Bohra Muslims saint, a large numbers of Bohra Muslims visit this place during Urs from different parts of the world every year.